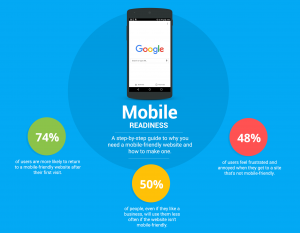 The Google Adwords team recently published a post on how to get better insights into mobile traffic on a web site. Most businesses see a shift in customer behavior that indicates customers are both more comfortable converting on their mobile devices and are shifting their research to mobile. To understand this better, we have created a new dashboard for you that helps you analyze mobile specific data for your own website. The problem with this dashboard is that it only shows generic information. Mobile vs. not mobile is is an important differentiator, but “mobile” is a wide definition. The mobile space is endlessly diverse and extremely dynamic. For example, the chart grouping traffic based on operating system is “nice to know”, but that’s about it. Even within iOS or Android the diversity of devices, browser and capabilities is vast. An iPhone 6S Plus is a very different device compared to a iPhone 5. Similarly, a low end Android device is miles away from the latest fashion top model from Samsung. This is true for everything from screen size to processing power. This will affect your conversions and usability of your site, thus it’s critical to monitor continuously. Read a detailed explanation here.